Premier League clubs have created Champions League history, with five qualifying for the knockout stage. Chelsea, Liverpool, Manchester City, Manchester United and Tottenham have all progressed, making England the first country to have five teams in the competition's last 16. This was also the first time the Premier League had five representatives in the group stage, United earning their place by winning the Europa League last season. English sides have been dominant in the group stages. Tottenham topped a tough Group H that also included Real Madrid and Borussia Dortmund, finishing on 16 points - more than any other team managed in the group stage. Liverpool were the second-highest scorers, hitting 23 goals in their six games. Only PSG (25) managed more, and three of the top six scorers were Premier League clubs. Liverpool, Manchester City, Manchester United and Tottenham all finished top of their groups. It is the first time since 2006-07 that four English teams have finished first in a single group campaign. And the English clubs' collective win percentage - 70% - has only been bettered twice - in 2013-14 (English clubs with 70.8%) and 2014-15 (Spanish clubs with 70.8%). Has any country had five teams in the Champions League before? Once - Spain in 2015-16, when Atletico Madrid, Barcelona, Real Madrid and Valencia were joined by Europa League winners Sevilla. Barcelona and the two Madrid clubs won their respective groups, but Valencia and Sevilla failed to reach the knockout stage. Barca lost in the quarter-finals to Atletico, who were beaten in the final by city rivals Real on penalties. Is this the first time all English clubs have progressed? No. Since the Champions League returned to a one-group-stage format in 2003-04, it has happened seven times in 14 years. Prior to this season, it last happened in 2013-14, when Arsenal, Chelsea, Manchester City and Manchester United all went through. What happens when all English clubs reach the knockout stage? In five of the six previous seasons that all of the English clubs involved have reached the knockout stage, at least one has made it to the final. The only time that did not happen was in 2013-14, when Chelsea were beaten by Atletico Madrid in the semi-finals. Going on to win the competition has proved a little more tricky. The only triumphs were in 2004-05 (Liverpool) and 2007-08 (Manchester United). Still, an English side reaching the final this season would mark significant progress after five barren years. Since 2003-04, seven different English clubs have appeared in the Champions League group stages - Arsenal, Chelsea, Leicester, Liverpool, Manchester City, Manchester United and Tottenham. In those 14 seasons, the teams reaching the group stages have qualified for the knockout stage 84% of the time. The highlight was 2007-08, with Arsenal reaching the quarter-finals, Liverpool making it to the semi-finals, and Manchester United beating Chelsea in the final. The low point was 2012-13, when only Manchester United and Arsenal made the last 16, and both exited at that stage. Who could English teams face in the last 16? Before any team can start thinking about the final there is the small matter of getting through the last-16 stage. Manchester United (Group A winners): Bayern Munich, Juventus, Sevilla, Shakhtar Donetsk, Porto, Real Madrid. Chelsea (Group C runners-up): Paris St-Germain, Barcelona, Besiktas. Manchester City (Group F winners): Basel, Bayern Munich, Juventus, Sevilla, Porto, Real Madrid. Tottenham (Group H winners): Basel, Bayern Munich, Juventus, Sevilla, Shakhtar Donetsk, Porto. In a BBC Sport vote, 40% of readers picked Manchester City to go furthest in the Champions League. Chelsea boss Antonio Conte: "With five English teams to go through to the next round means the level of this league is very high. "Don't forget here this season is very tough. You have to play a lot of games, but when you arrive at the final stage to play for quarter-finals, semi-finals, the English teams have a lot of games in their legs. "For this reason I think it could be problematic to win the Champions League." Liverpool manager Jurgen Klopp: "We knew if we won we would top the group so that's not the biggest surprise but I think it's strange this year in the group stages. "There are a lot of really strong teams. This year is quite special. Not often you can face Bayern Munich and Real Madrid, but Juventus and all the others. "Antonio Conte said it - there are no easy opponents and I don't think anyone is happy when they get us in the draw. We will not be happy when we see who we face in the next round, but we will be ready." Manchester City boss Pep Guardiola: "In this kind of situation in the Champions League there is a lot of talk about the draw and it depends how the team arrive in that moment, on that day. "Maybe you are good today and in February you are a disaster or the opposite. It will be tough, the three contenders are tough [Real Madrid, Barcelona and Bayern Munich] and so are the others but we are going to try." Manchester United boss Jose Mourinho: "After the knockouts, it'll be just eight. Let's see. "We are not candidates [to win the Champions League], far from it. There are very powerful teams who have great experience at this level. "Let's see how it goes but now we have lots of matches in English competitions and we can forget the Champions League for a couple of months." Tottenham manager Mauricio Pochettino: "It's a fantastic achievement for this team but it's still a long way to the final. We need to wait until the end of February to play again and we need to see the draw. "I hope we keep our level but the motivation to play in the best competition in the world is massive, so of course we're going to try and win every game and try to go as far as we can." Who has the best chance of winning it? Of the five English teams who have reached the knockout phase, Manchester City have the best chance of reaching the last eight (61.5%). Winning the group, as four of the English teams have, might seem an advantage but with three of Europe's best five clubs according to the Euro Club Index - Real Madrid, Bayern Munich and Juventus - finishing second in their groups, tough draws are likely for some. Even Shakhtar Donetsk and Sevilla aren't easy opponents as they are among Europe's 17 best teams, according to our ranking. Prior to the draw, the other four English clubs all have between a 43% and 56% chance of progress to the last eight but these figures could change a lot depending on the draw. The big five European teams of Barcelona, Real Madrid, Bayern Munich, Paris St-Germain and Juventus are obviously the ones to avoid, which is particularly bad news for Chelsea as they have only three possible opponents, two of which are Barcelona and PSG. Of the Premier League teams, Manchester City have the best chance of winning the Champions League, albeit only 8%. Barcelona are the favourites with about 28% chance of ending the season as Champions League winners. BBC Sport's chief football writer Phil McNulty assesses each of the Premier League teams' chances of winning the Champions League. Chelsea's Champions League campaign has been a mixed bag, with an outstanding win at Atletico Madrid offset by the damaging home draw with the La Liga side on Tuesday, the loss to Roma in Rome, and draw with the same opponents at Stamford Bridge. Antonio Conte's side have looked unconvincing and vulnerable at times but should also be given credit for qualifying from a tough group, albeit in the second place that leaves them vulnerable to a pairing with giants such as Paris St-Germain and Barcelona in the last 16. Chelsea's in-built resilience - as well as world-class talent in the shape of Eden Hazard - should not be under-estimated but, at this stage, and on the current evidence, they look more like outsiders than a side ready to do damage as the competition goes deeper in the knockout stage. Conte insists the last 16 holds no fears for Chelsea, and while it would be an optimistic assessment to mark them out as contenders to win, past history tells us they should never be under-estimated. Liverpool's strengths and frailties have been on show for all to see throughout a group campaign that marks them out as real wildcards for the knockout stage. Jurgen Klopp's side have shown they can produce blistering attacking football and shambolic defence in the space of 90 minutes, especially when drawing 2-2 with Sevilla at Anfield before handing over a 3-0 half-time lead in the return game in Spain. Mo Salah, Sadio Mane, Roberto Firmino and Philippe Coutinho can unsettle any opposition left in the Champions League - but look down the other end and Liverpool possess a defence that can also concede to any team left. It's been a remarkable goal haul of 23 in the group stage - the most ever by an English side - and the Reds were terrifyingly good in their 7-0 wins over Maribor and Spartak Moscow. Anfield is a dangerous place for anyone to go once the Champions League reaches the last 16, and Klopp's Liverpool will be the great unpredictable once that phase gets under way. The Premier League's most likely winners of the Champions League based on strength of squad, their form and a manager in Pep Guardiola who knows what needs to be done to win this competition and how to do it - although having Lionel Messi at Barcelona rather helped his cause. City have cruised through their group and the 4-2 win at Napoli was the sort of result and performance designed to make their potential Champions League opponents sit up and take notice. Guardiola's team possess an embarrassment of attacking riches capable of scoring goals against anyone, although there remains a question to be answered about City's defence against the sort of high-class opposition they are likely to face when the Champions League gets to the sharp end. City's exit to an excellent Monaco side in the last 16 last season was arguably the biggest disappointment of Guardiola's first season as he was brought to Etihad Stadium with that next level of Champions League progress in mind. The signs are there that this season will bring greater joy. City can certainly be ranked among potential Champions League winners. United's draw may not have been the most testing but they came through with impressive efficiency and the minimum of fuss to comfortably top Group A.
Jose Mourinho's team, typically, are built to sustain a serious Champions League campaign and he has been over course and distance in this competition before when winning it with Porto and Inter Milan. He has proven experience in guiding his teams through the increasingly pressurised knockout stages. United are physically strong, organised in defence and have a range of attacking options that will be bolstered by the return of Zlatan Ibrahimovic to full match fitness in the coming weeks to add to the threat of talent such as Romelu Lukaku, Marcus Rashford, Anthony Martial and Jesse Lingard. At this point, it is a stretch to picture United as Champions League winners but Mourinho is correct to say no-one will relish a two-leg meeting with them, especially with someone with his European know-how guiding them. 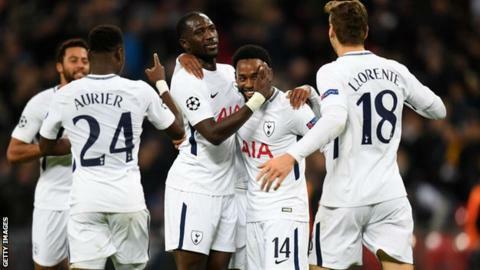 Spurs were handed arguably the toughest task of the Premier League clubs when drawn alongside holders Real Madrid and Borussia Dortmund - but Mauricio Pochettino's side have performed superbly to top their group. Their draw at the Bernabeu and brilliant 3-1 victory against Real at Wembley announced Spurs as a genuine force in the Champions League. It is ironic that a team that struggled so badly in the tournament last season has flourished this term while suffering indifferent form in the Premier League. Pochettino will hope they are producing the level of performance that swept Real aside when the knockout stage begins. Spurs are very capable of moving further than the last 16, especially if Dele Alli can rediscover his best form consistently alongside the potency of Harry Kane and Christian Eriksen. Dark horses but more likely last eight.